After a festival performance, audience members write, “Your singing is amazing. Thanks for a lovely afternoon”. After an evening jazz club show, “Your voice was clear and strong as was your spirit. Such an amazing concert and a great tonic for these troubling times”. One avid fan noted “Her insides are on the outside”, “So refreshing after all that is trite”. Floating seamlessly across diverse genres of jazz, pop, meditational, soul, and Broadway, Lorraine’s signature styling shines through, as does her genuine love of connection with the audience. She has lived and brings her genuine warmth and compassion into her work. Happily singing since childhood, Lorraine developed prowess in choirs, and then in regular weekend performance in Vancouver while attending college. After moving to Tokyo, marrying and raising a family, performing was put on hold, while life experience was collecting. At the end of her marriage in 2008, she re-discovered herself and steadily blossomed. The Victoria Conservatory of Music’s jazz program and more choir and solo work led to her debut CD in 2011. First Off the Floor was recorded in Rick Salt’s studio in Nanaimo, with Misha Piatigorsky on piano, Ken Lister on bass, and Kelby MacNayr on drums. The pain of love dissolved resonants in the standard ballads, “Don’t Explain”, and “I’m a Fool to Want You”. An indomitable spirit is clearly driven home in “On the Sunny Side of the Street”. Regular shows on various stages ensued, collaborating with the wondrous talents in Louise Rose, Miles Black, Joey Smith, Kelby MacNayr, Cliff Maddix, Misha Piatigorsky, George Mcfetridge and more. Before pedalling her bicycle to Jasper in the summer of 2016, she wanted to record the original tunes that had been bubbling inside her since 2010. Back in Salt’s studio, this time with Joey Smith on bass, Kelby MacNayr on drums, and Louise Rose on piano, the collaboration of talents was magical and the songs were born. Released in January of 2017, On the Edge encompasses the many moods and themes that reveal her heart. The compilation was well-received in debut concerts, with audience members agreeing, “The best were your original pieces”. Video producer Shiraz chose the song, “Offline” as his favourite for a music video, shot over November 2017, to be released shortly. 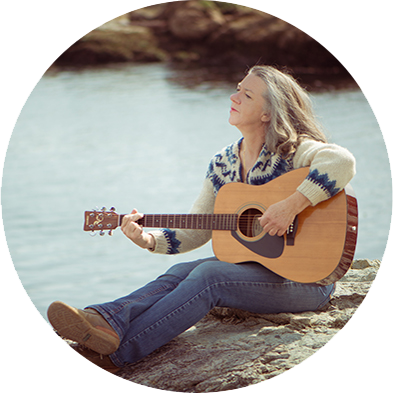 Lorraine’s own studio has been a few years in the making and will be the setting for small house concerts, practice, inspiration, and live recording. She is currently finishing a short film-making course of her own and hopes to use the new skill to bring more of her work to the online world. Musical and vocalist influences for Lorraine are many and her gratitude for her mentors immeasurable, for Louise Rose, Rene Marie, Sachal Vasdani, Ana Velinova, and Eileen Cooper, to name just a few. All she wants to do is sing. Lorraine is as comfortable performing in a duo as she is soloing in front of a 100+ voice choir, and everything in between. Please use the contact page for any queries regarding performance at your private function, wedding, club, concert, or festival. Thank you for visiting the site, and supporting Lorraine and all local musicians, and live music in general.